Who say you can’t serve your family an amazing roasted Italian Chicken Dinner during the week. 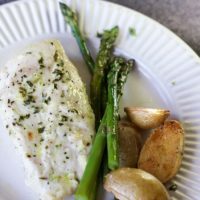 When I served up this Easy Italian Chicken for dinner last week, my daughter commented on just how fancy it looked. Fancy visually, roasting your dinner is such an easy way to bring out the flavors of your food and get food on the table in about 30 minutes. Outside of marinating time, this dinner took 30 minutes. I don’t know about your but that is the ideal amount of time to make a family dinner on busy weeknights. 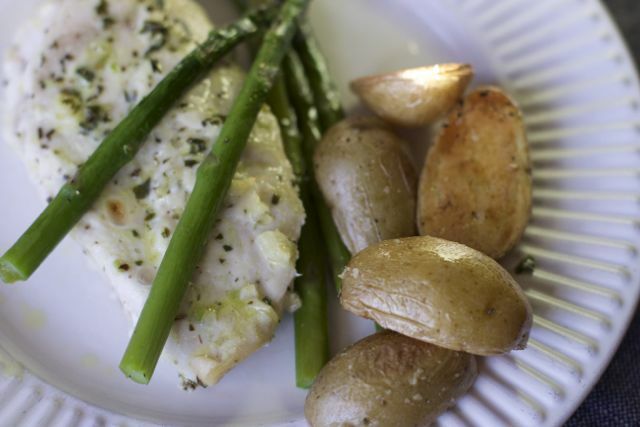 This meal is nice enough in presentation that you could serve it at a dinner party too. This recipe is brought to you by my late grandmother. Although she never used chicken breasts, they were too expensive. Traditionally she would use chicken pieces and we would all race to get the chicken breast. 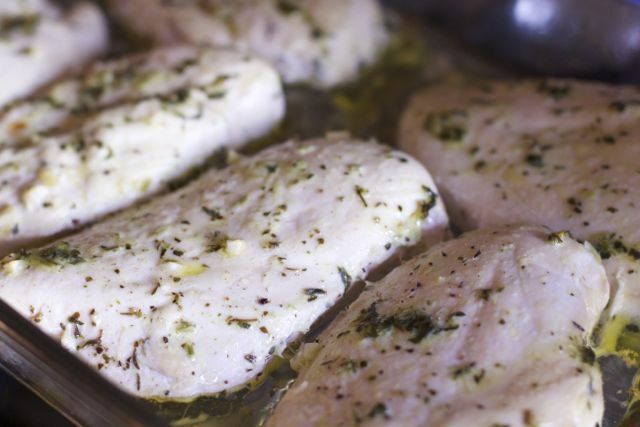 I had to adapt the cooking time as boneless chicken breasts take no time to bake. 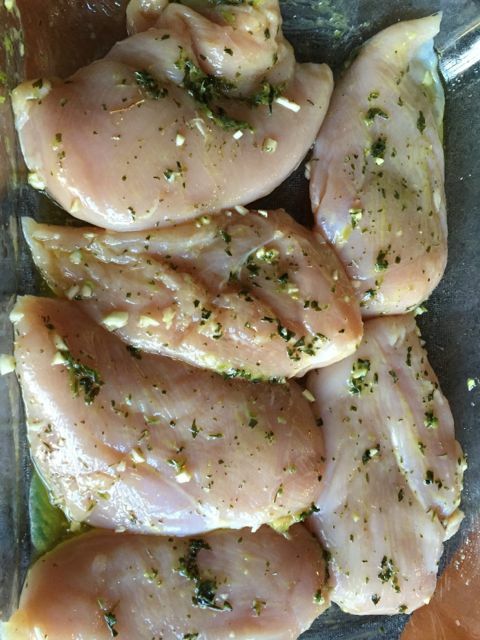 Coat all your chicken pieces with the popular Italian Flavors of oregano, garlic and olive oil. Once the chicken is in the oven you need to prepare your veggies. 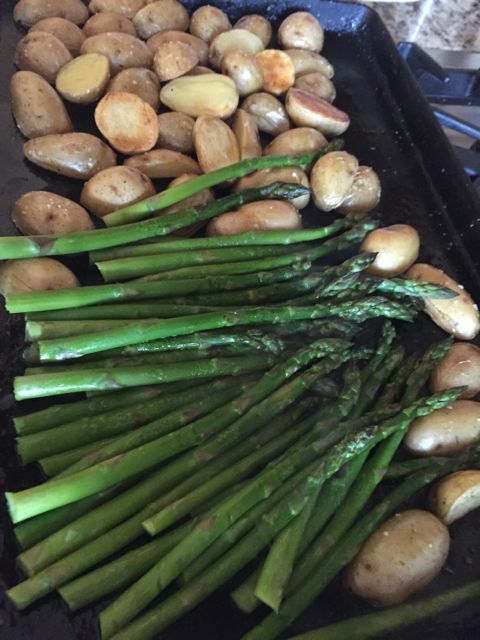 Start with the potatoes first and roast them for about 10 minutes before adding the asparagus. I did it all on one cookie sheet for easy clean up. Obviously if you have a larger group divide the veggies on two. Making sure your chicken is cooked thru is so important. Having a good instant read thermometer really does make cooking easier. The Thermapen Mk4 is just what our house needed. We have had inexpensive thermometer before, but the numbers were so small I would have to pull out my readers. This new one comes in 10 colors, is water proof, has a motion sensing sleep and ale mode, up to 3,000 hours and uses a AAA battery instead of those small cell batteries you don’t have on hand. The best time to test your food is in the oven and the Thermapen can rotate in so you can get any angle you might think of. When I cooked this steak on the stove top, I liked that I could use a longer angle so I avoided the flame. Plate up your easy Italian Chicken Dinner and your family will be truly impressed. Think about purchasing a Thermapen for Mother’s Day or Father’s Day gifts. They are such a necessity in any kitchen. Coat potatoes with olive oil, salt and pepper. Lay on a cookie sheet and put into oven after 10 minutes of chicken cooking. Coat asparagus with salt, pepper and olive oil and add for last 10 minutes of chicken cooking time. Ah, that’s too much for a steak! 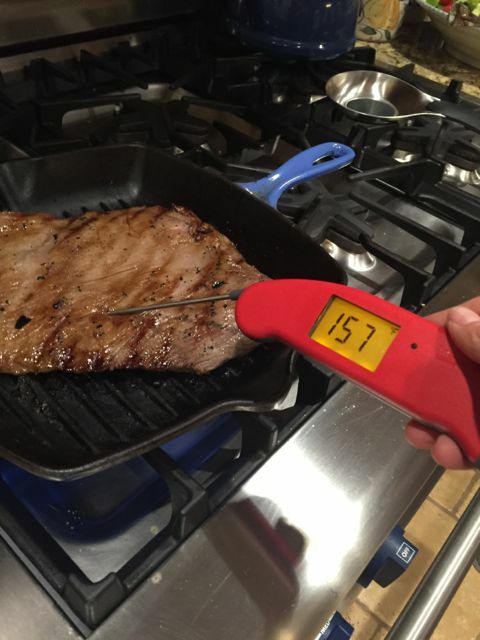 132 is perfect for a medium-rare steak. I can’t stand mine well-done! What an amazing dinner! I love that it is all baked! I think your instant read thermometer is a must have for anyone who loved to cook, I need to get one!!! Oh wow, this looks so delicious and easy enough that I could pull it off. My daughter loves working with me in the kitchen. I love that it turns on and off when you open it and it is flexible in the way you can hold it. I need a new thermometer. Ours broke over the holiday and have yet to buy a new one. Can’t wait to try this recipe! I always appreciate a recipe that includes asparagus. I will absolutely have to try the one you shared. Wow, what a great dinner. I love that it is all made in the oven. 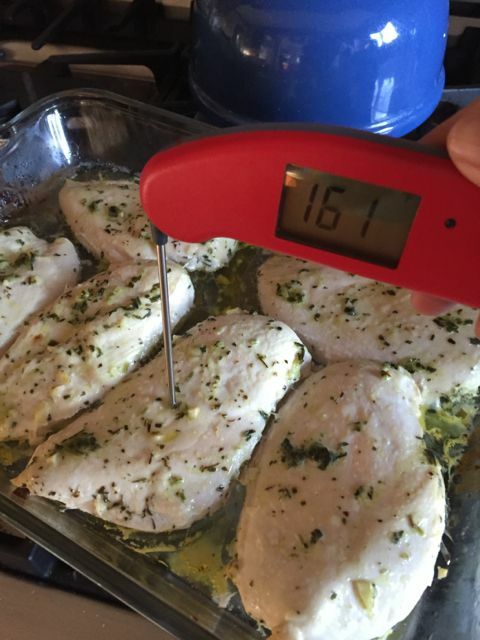 I think your instant read thermometer is a must have for anyone who loved to cook! This chicken looks fabulous! We need a new thermometer…My husband keeps running them through the dishwasher. let’s see if this one can last with him! I love that the thermometer can bend in all directions. 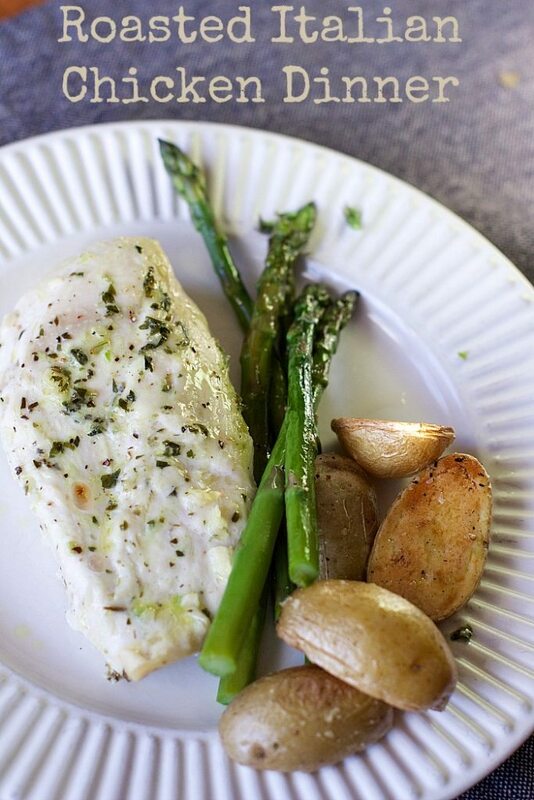 This recipe looks so good, especially the asparagus!